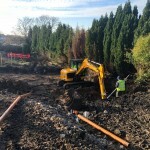 Spring and Company has been delivering property and construction services for the last twenty five years, from our offices in Stockport, Leeds & London. Our strength lies in our ability to tackle challenging construction projects, acting in a variety of roles including client advisor, project manager, quantity surveyor, employers agent, Principal Designer and CDM Adviser, fund monitor and construction delivery partner. We have experience of new build and refurbishment projects ranging in value from a few thousand pounds to multi million pound projects. We have the resilience to manage numerous major commissions at any one time, but maintain a small medium enterprise ethos in providing a personable service, tailored to suit each individual Client. We pride ourselves on the personal service we provide to our Clients and are rewarded by an exceptionally high level of referred or repeat business. “I have had close dealings with Spring and Company on ”The Green” development and have always found them to be professional, competent and enthusiastic. Their pro-active and enthusiastic approach was a major factor in driving the development to completion from its inception, whilst keeping it on budget and to the high quality that this scheme merited. I would have no hesitation in recommending Spring and Company as Project Manager to any Client who is looking for an outstanding level of performance in the future”.